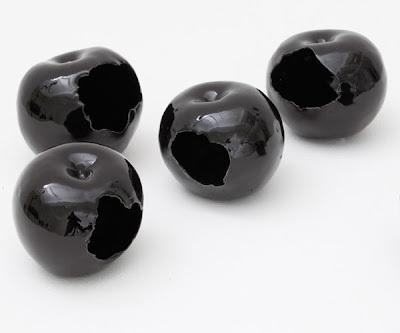 Brooklyn based artist Julia Chiang has created a unique edition of 50 glazed porcelain apples available at OHWOW. Chiang is drawn to the apple both as a symbol of desire and as an icon of the city of New York. Each apple is approximately 3” high x 3 1/2” diameter and includes a signed and numbered card. According to Chiang, "Most of what I do reveals the unevenness and imperfection of my hand." "I am interested more in what are viewed as flaws rather than perfection, and in finding objects and materials that hold a story and history."